This is the benchmark book on to the effects and implications of social media on our daily lives, and how businesses can harness its power. 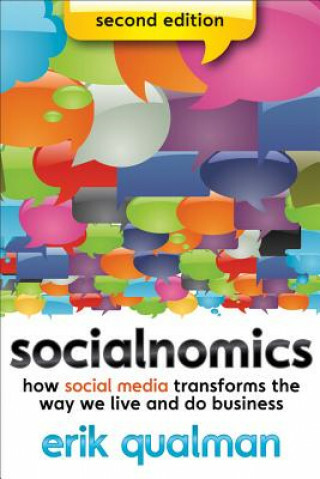 "Socialnomics" is an essential book for anyone who wants to understand the implications of social media on our daily lives and how businesses can tap the power of social media to increase their sales, cut their marketing costs, and reach consumers directly. In this revised and updated second edition, author Erik Qualman presents new material based on meeting with 75 Fortune 1000 companies, 50 colleges and universities, and over 100 small businesses & non-profits since the first edition. Qualman's materials have been used from IBM to NASA to Harvard to local businesses. It lists the top ten easy opportunities that companies and organization miss when it comes to social media. It describes where social media should reside in an organization and the necessary building blocks for success. It explains why over 50 percent of companies still block social media to their employees and why this is a detriment to success. It shares proper training methods for your entire organization on social media; not just the chosen few. It reviews the top companies, organizations and individuals using social media, explaining what separates them from other companies and how to replicate their success. Social media can transform your business and your relationship with consumers. Discover what social media can do for you, and what you can do for others while using social media.